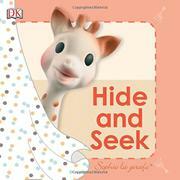 Part of the Sophie la girafe series, this small, square, interactive board book features Sophie playing a game of hide-and-seek. First, readers look for Sophie behind the laundry basket. Substantial, easy-to-grab tabs make it easy for little hands to lift the flap, but Sophie isn’t there. Instead, they see a toy elephant. Next, readers look behind the curtain, and yes, there’s Sophie! Babies and toddlers will appreciate not having to wait until the final page to find her. Here, they get to find Sophie multiple times, first in the house behind the laundry basket, then in the yard behind the flowers, and finally, at the beach behind an umbrella. The final pages review the game, recounting the items found while looking for Sophie: a toy elephant, a big-eared rabbit, and a blow-up crocodile. This title is well-suited for little hands, and the uncluttered visuals feature coordinating patterns on images, borders, and tabs. Published simultaneously, Sophie on the Move is a touch-and-feel book that depicts Sophie traveling by car, tractor, plane, and more, while incorporating various tactile elements in the cheerful illustrations.